The Glessner family lived in this house for fifty years, through the heyday and decline of the Prairie Avenue neighborhood. John Glessner cherished the home as a symbol of happy family life, and the interiors of Glessner House demonstrate the nearly perfect collaboration between the architect and his clients. Designed during the so-called Gilded Age, when America’s newly rich industrialists were living in modern-day castles, Glessner House represents architect Henry Hobson Richardson’s response to the Glessners’ desire for a simple, comfortable home that retained the “cozy” feeling of their previous home on West Washington Street. Richardson responded to this request with a structure that was a brilliant and, for a time, revolutionary expression of the urban townhouse mansion. The house is also quintessentially Richardsonian: monumental, fortress-like, designed with the site in mind, featuring massive rusticated stone blocks, round arches and design elements derived from French and Spanish Romanesque architecture. From above, the house appears to be E-shaped, extending virtually to the lot line on the east, north and west sides. The house’s fortified appearance is boosted by a foundation constructed of Illinois dolomite, with walls of Braggville pink granite. These walls are only eight to ten inches thick, concealing a structural wall of common brick. Below the first floor level, the stone is slightly battered, and the basement windows along the Prairie Avenue façade bear granite grilles. The second floor windows are much more refined, divided by mullions with unique, finely carved capitals. The façade facing 18th Street is based on a photograph the Glessners owned of Abingdon Abbey; Richardson saw the photograph during his first visit with the Glessners and promised to make it a key inspiration for the design of their house. Throughout the exterior and interior of the house, observant visitors will find ouroboros (dragons eating their tails), acanthus leaves, and delicate G shapes. To some extent, the design was a practical response to a long narrow site among other houses in a neighborhood growing rapidly in population, rather than springing from art historical precedents. The massive walls suggest that while the house is located within an urban environment, it is not necessarily part of it; the courtyard façade expresses exactly the opposite sentiment, with lots of doors and windows that allow in abundant light. Unlike other Prairie Avenue houses at the time it was built, Glessner House was built as close to the lot edge as possible and was attached to the house next door. Richardson drew inspiration from Italian renaissance palazzi, but during an early visit with the Glessners, he was captivated by their photograph of outbuildings at Abingdon Abbey. 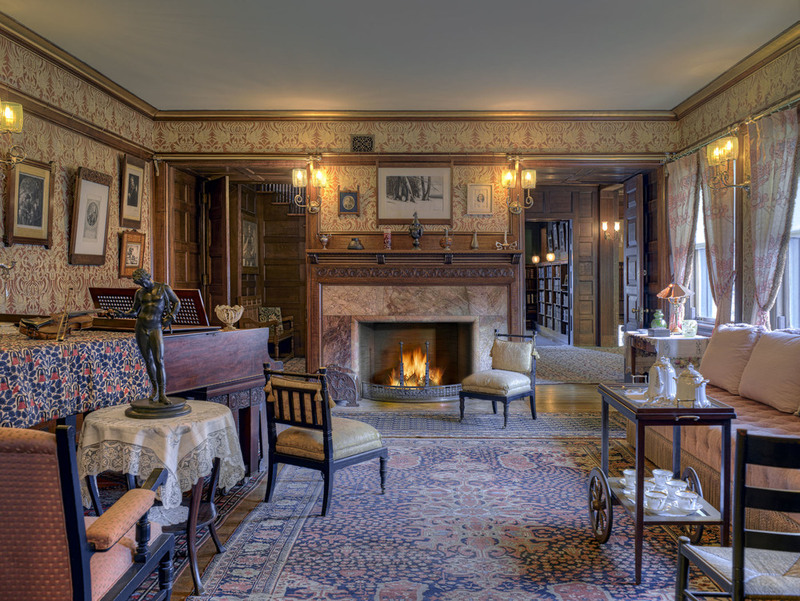 Frances Glessner had a keen interest in the English medieval revival, of which Abingdon Abbey was a key symbol. The Abbey had been of great interest to John Ruskin, a leader of the English Arts and Crafts Movement, and also indicates that Richardson and the Glessners were interested in the Anglo-American romantic historicism of the late nineteenth century that sought retreat from industrialized modernity into rural domestic life. Although the house contains over 17,000 square feet, domestic scale is preserved throughout. There are no vast empty spaces. And although many of the rooms are symmetrically planned, often with a centrally-placed fireplace flanked by doors or openings on one wall, the rooms are connected to each other asymmetrically, establishing a nice balance between formal and informal. In addition, more than half of the space was used for service. There are three bedrooms for family use, two for guests and eight for servants; three bathrooms are attached to family and guest rooms, two for servants, and a half-bathroom under the main hall stairs. There are eleven fireplaces and seven different staircases. Though it was wired for electricity when it was built, the house was lighted with gas for the first five or six years the Glessners lived here since no infrastructure existed to provide electricity to the neighborhood; the entire house was electrified in time for the World’s Fair in 1893. On December 1, 1924, the Glessners and the Chicago Chapter of the American Institute of Architects signed a deed of gift that would give the house to the CCAIA upon the Glessners’ deaths, provided that it be used, according to the deed, “solely for the purposes of architecture and the allied arts and sciences… The house is to be known as GLESSNER HOUSE.” Frances Glessner died in 1932 and John Glessner in 1936. The high costs of maintenance in Depression-era Chicago led the CCAIA to return the house to the Glessner family in 1937. The heirs deeded the house to the Armour Institute (now the Illinois Institute of Technology), and in 1946, the Lithographic Technical Foundation leased the house and converted it for their use, leaving the original floorplan intact. The company bought the house in 1958 but relocated to Pittsburgh, Pennsylvania in 1965, placing the house up for sale at $70,000. 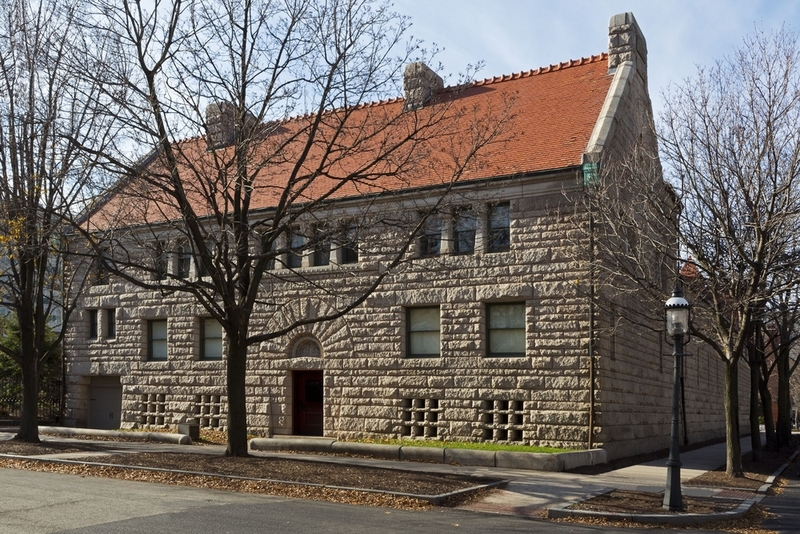 A handful of local architects and early preservationists joined together in 1966 to form the Chicago School of Architecture Foundation in order to save Glessner House. The Foundation bought the house for $35,000 in December 1966, and spun off Glessner House Museum as a separate non-profit corporation in 1994.